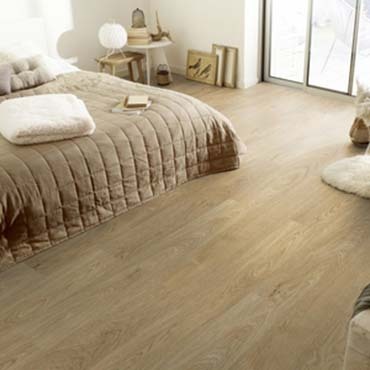 Tarkett Laminate Flooring offers hardwood look that is emulated and perfected. Tarkett Laminate Flooring never fades, wears or stains – it shines indefinitely. Moisture resistant, easy-to-install, with both formal and casual options, you’re sure to find a style that embraces your personal taste. You’ll discover four worlds, each with their own characteristics, each with their own collections. Are you inspired by traditional, nature or upscale sophistication? Only once you travel through each world will you know for certain where you stand. Feel at home with your values. The Essentials World is defined by designs enhanced through a palette of technical innovations that allow you to breathe new life into a room. The Solutions™ and Occasions® Collections ground you in today, while guarding your precious day-to-day memories. This is design at its most sensible. How comfortable do you want to make your home? Ground yourself in today, while guarding precious day-to-day memories. Step into a world inspired by the nature of faraway countries. Where pure decorative solutions and real textures coexist. Bring home the exotic found within the tested Tropical™ or the new Jungle™ and Madagascar™ Collections. Each stands out for their unique spirit, yet remain linked for their original marked wood characteristics and dedicated finishes. This is where new trends are defined. Where do you want to take your home? Where pure decorative solutions and real textures coexist. Through the passing of time, we learn. And with the innovations of today, we create. In The Vintage World, yesterday is celebrated through the progressive style and feel of our Urban Luxury™ and new Cinque Terre™ Collections – both featuring an authentic hardwood look and beveled edges. The first collection pays tribute to centuries old techniques, while the second prevails as an homage to unique stone-scraped textures. This is a world rooted in prestige. How impressive would you like your home to feel? Centuries-old techniques to unique stone-scraped textures. Emulates the natural material stone. In the universe of The Minerals, Tarkett showcases its entire technological know-how, creating a product with a structural expressiveness very close to the true beauty of nature. An occasional damp mopping with a neutral cleaner, such as Tarkett SureShine Cleaner is generally all that is required to maintain the surface wear layer. Do not use soaps or detergents because they may leave a film on the floor. It should never be waxed, sanded or refinished. This product is very scratch resistant. However, it is not scratch proof. To help minimize scratching, proper protectors, such as felt pads should be used on frequently moved furniture (chairs, tables, etc.). What happens if I damage a panel? If an individual panel is damaged during use, it can be replaced without having to remove the entire floor and since this product does not require dye lots and does not fade, the replacement panel will match perfectly.